Recent research in brain-computer interfaces (BCI) shows that brain activity can be used as an active/voluntary, or passive/involuntary control modality in man-machine interaction. While active BCI paradigms have received a lot of attention in recent years, research on passive approaches to BCI still desperately needs concerted activity. However, it has been shown more than once that brain activations can carry information about the affective and cognitive state of a subject, and that the interaction between humans and machines can be aided by the recognition of those user states. To achieve robust passive BCIs, efforts from applied and basic sciences have to be combined. On the one hand, applied fields such as affective computing aim at the development of applications that adapt to changes in the user states and thereby enrich the interaction, leading to a more natural and effective usability. On the other hand, basic research in neuroscience advances our understanding of the neural processes associated with emotions. Furthermore, similar advancements are being made for more cognitive mental states, for example, attention, fatigue, and work load, which strongly interact with affective states. The workshop will be held in conjunction with the 4th International conference on Affective Computing and Intelligent Interaction (ACII2011) at the FedEx Institute of Technology at the University of Memphis, TN. The papers should feature original empirical work, theoretical work, or a well defendable but arguable position of the authors (i.e., not submitted, in submission, or submitted to another conference or journal while in review). Papers will be published in the proceedings of ACII 2011 by Springer. Papers should not exceed 10 pages and should be formatted according to the Springer LNCS formatting guidelines http://www.springer.com/computer/lncs?SGWID=0-164-6-793341-0. Papers must be submitted as PDF through the EasyChair conference system, which can be accessed through the workshop web site and the ACII conference website. 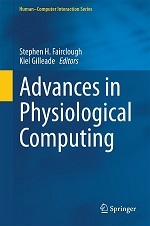 This entry was posted in Events and tagged affective computing, BCI, cfp, physiological computing on May 11, 2011 by Steve Fairclough.